- Design features, study guides and web support to help students achieve exam success. 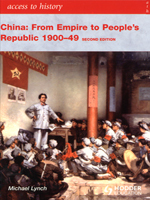 In 1900 China was politically undeveloped and economically exploited by western colonial powers. Over the next fifty turbulent years it had rejected its imperial past, welcomed republicanism, survived Japanese occupation, witnessed civil war and embraced a Marxist revolution. These extraordinary developments are examined in this book which combines a factual narrative with up-to-date analysis of the events. Throughout the book, key dates, terms and issues are highlighted, and historical interpretations of key debates are outlined. Summary diagrams are included to consolidate knowledge and understanding of the period, and exam-style questions and tips written by examiners provide the opportunity to develop exam skills. Relevant content specific to the AS and A Level history specifications. In-depth coverage of the period presented in an accessible way. Exam-style questions and tips written by examiners offer support with assessment. Summary diagrams throughout aid with revision of the key topics and themes. Modern History Lecturer Leicester University; Best-selling Access To History author and series editor.